Already tempted by the Asha 501, Nokia's featurephone disguised as a smartphone? Well the phone is about to roll out globally, meaning it won't be long until you can pocket Nokia's vibrant little number. The Finnish phone maker confirmed that the Lumia-like handset will be launching in Thailand and Pakistan this week and then roll out to Europe and other countries in "subsequent weeks". This one won't be hitting the US and Canada for now. Don't get too excited about the specs though - with only 2G connectivity on offer, the 501 is the budget buyer's choice. It also packs a 2-inch QVGA display, 3.2MP camera, along with a 4GB memory card in the box. 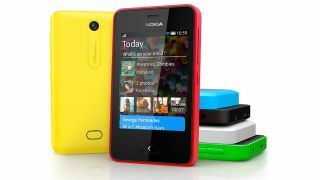 The phone runs on Nokia's overhauled Asha software, which brings in the big Windows Phone icons and simple swiping. Meanwhile there are two main screens, the 'Home' and the 'Fastlane'. The former has the traditional grid of apps while the latter is a feed of messages and updates, as well as recently-used applications. Still, set at a recommended retail price of €75 (about £65), it promises to be perfect for those bridging the gap to a full smartphone, or for festival-goers looking for a decent backup handset that won't break the bank. Not only will it be coming in at a budget price, it'll also be presenting itself in six colours: yellow, cyan, bright red, bright green, black and white. Nokia claims that the phone will also offer 47 days of battery life on standby, and 17 hours of talk time. Not bad if you ask us.